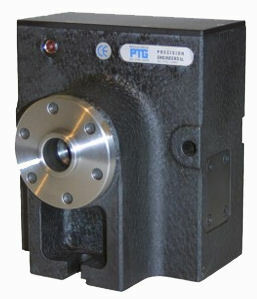 The PTG 125 rotary speed indexer offers a great value alternative to an expensive 4th axis rotary table. Fast, rigid, versatile and accurate it is easily interfaced to any CNC machine tool with a spare m-code. HAAS, Bridgeport, Cincinnati, Hurco, Yang, Mazak, XYZ, Doosan and many others available. Please call or e-mail to discuss your CNC rotary application. We also have spares and knowledge to help you keep your Kenametal, Crenol and Wilson and Erickson speed indexers 400 and 600 running.